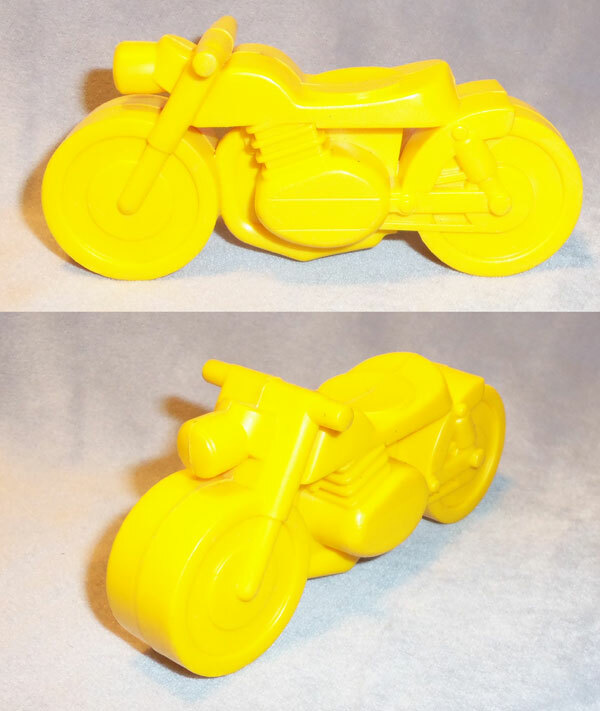 Description: Yellow 1-seat motorcycle (no movable parts) with 2 wide wheels, molded engines on the sides, molded handlebar, headlight and seat on top. The seat has a recessed circular area in the center (seat for Weeble). Other: Measures 4-1/2" long x 2" tall x 1-1/2" wide. Squared red brick "building" with a blue door on one side, a 4-pane window and blue lever on the other side, a blue roof, and triangular base (hitch on front) and 2 small black wheels under the "building". Press blue lever to make Weeble figure inside fly up/out through the blue roof. Description: Small white boat trailer (HTW105 boat fits inside). The trailer has a hitch on front and rolls on 2 red wheels. 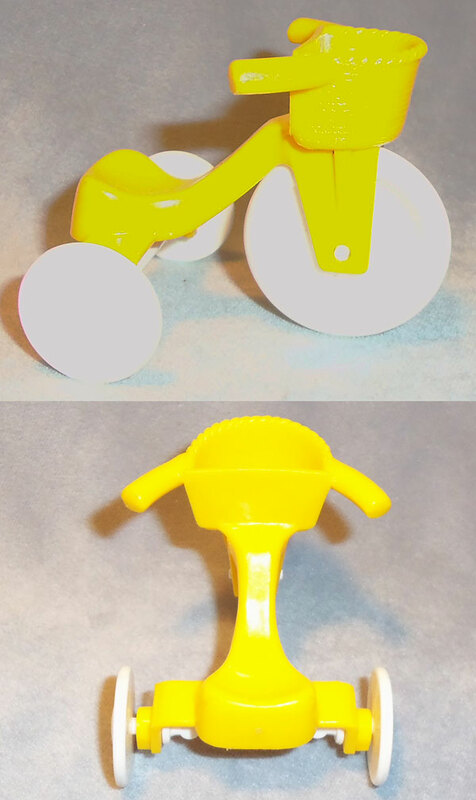 Small yellow tricycle with a small triangular seat, a basket on the front (between handlebars), and rolls on 3 white wheels: 1 large front wheel, 2 small back wheels. Description: Orange "western" wagon with molded "wooden" sides and wagon bed/floor. 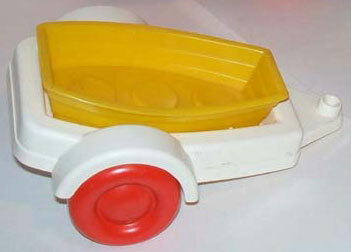 The wagon has a large white hitch on the front, rolls on 4 molded "spoke-wheels", has 1 rounded Weebles seat on the front, and top edge of the wagon bed has 4 rectangular holes to attach the removable wagon canopy. 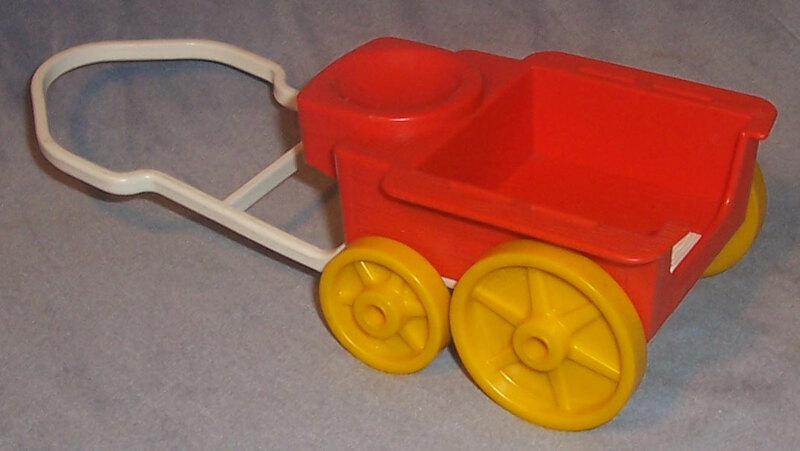 Other: The bottom of the wagon, and all 4 wheels are marked, "©1974 Hasbro®, MADE IN U.S.A.". Measures 8-1/8" long, 3-5/16" wide x 2-1/4" tall.